Space weather has long been part of operational forecasting for some governments, with NOAA’s Space Weather Prediction Centre in the USA, Met Office’s Space Weather Operation Center in the UK and Belgium’s Solar Influences Data Center at the forefront of space weather forecasting services. Some high-profile severe space weather events in recent times have alerted more governments to the impacts of these events worldwide. The 1989 power outage in Quebec, caused by a solar storm after a very large X15-class solar flare, and the ‘Halloween’ storms of 2003 brought space weather into the public eye. Severe space weather events have been included in the list of natural hazards along with tsunamis, volcanic eruptions, wild fires and hurricanes. The widespread disruptions caused by the Eyjafjallajökull volcanic eruption in 2010 caused a government review of all natural hazards in the UK. The Royal Academy of Engineering worked with expert scientists to publish a comprehensive report of the possible impact of a severe space weather event on UK infrastructure in 2013. This followed on from US reviews highlighting the large impact of space weather on vital infrastructure, such as those by the US National Research Council in 2008 and NASA in 2012. The UK governmental review led to a severe space weather event being added to the UK National Risk Register, and it is currently listed with between a ‘1 in 20’ and ‘1 in 2’ relative likelihood of occurrence in the next five years. The owner of this severe space weather risk is the Met Office, the national meteorological service for the UK, and a FLARECAST consortium member. It has set up a 24/7 space weather bench within its operations centre, providing advice and guidance to policy makers and other customers. 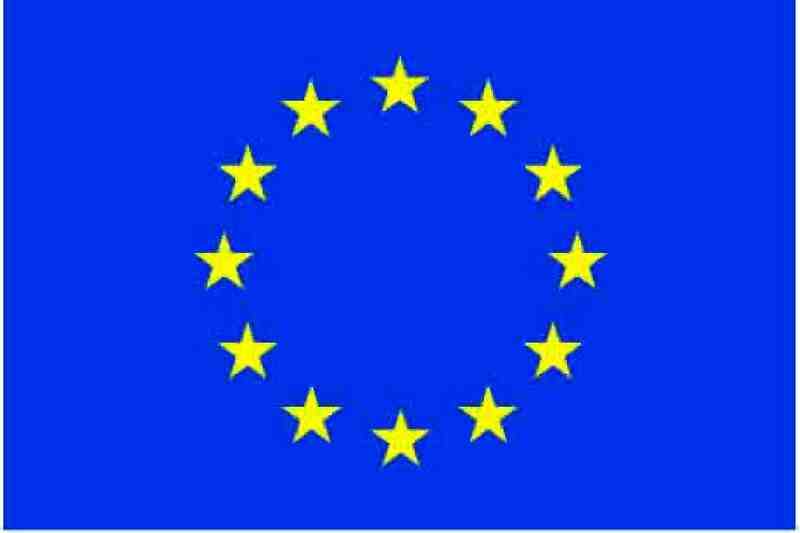 A number of other European countries have followed suit and are setting up their own official space weather services. Our society becoming ever more technologically advanced and, as a result, vulnerable and dependent on near-Earth space conditions, space weather events are also of concern to an increasing number of commercial industries. Private companies, in particular those from the re-insurance, space technology, and energy sectors, have a vital interest in this field. Geomagnetic disturbances may disrupt power grids, solar energetic particles may damage space-based instrumentation, and flares can cause radio blackouts (see Figure below). Insurance companies have taken a keen interest in flare research, considering satellites they insure could be impacted by solar eruptive events. Statistics show that a fraction of insurance claims are already associated with geomagnetic disturbances. Lloyds released a ‘360° Risk Insight’ report in 2010, highlighting the increased risk that adverse space weather shows in recent times. 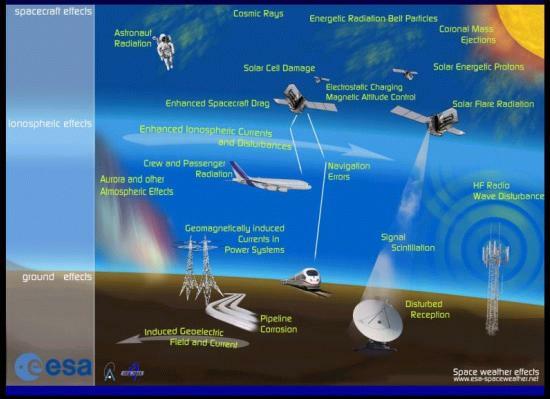 With a range of impacts at orbiting spacecraft altitudes down to the ground, space weather events are of interest to various end users, including spacecraft operators, space agencies, aviation, rail, power companies, marine, defence, insurance companies, and government policy makers. Governments and companies have invested considerable efforts assessing risks and developing strategies for strengthening vulnerable infrastructures. This process is ongoing, with each country having their own levels of infrastructure risk. Recent space weather strategies for the US and UK were published in 2015. There are other efforts aiming to put together information worldwide, with organisations such as the North Atlantic Treaty Organization, the World Meteorological Organization and the United Nations currently being the main actors. Most operational space weather services are members of the International Space Environment Service, working to provide a consistent message about current space weather conditions across the globe. New technological developments have to take into account space-weather-related hazards. At the same time, more knowledge about the drivers of solar activity and the propagation of radiation and particulate released during a solar event needs to be generated. FLARECAST focuses on where many solar events start: with a flare. The FLARECAST consortium will inform stakeholders from governments and industry on this website and at dedicated workshops, highlighting the results of the FLARECAST research project and its forecasting service. For more information please contact project manager Dr. Manolis Georgoulis or project scientist Dr. Shaun Bloomfield. Schrijver, C. J., R. Dobbins, W. Murtagh, and S. M. and Petrinec (2014), Assessing the impact of space weather on the electric power grid based on insurance claims for industrial electrical equipment, Space Weather, 12 (7): 487–498.